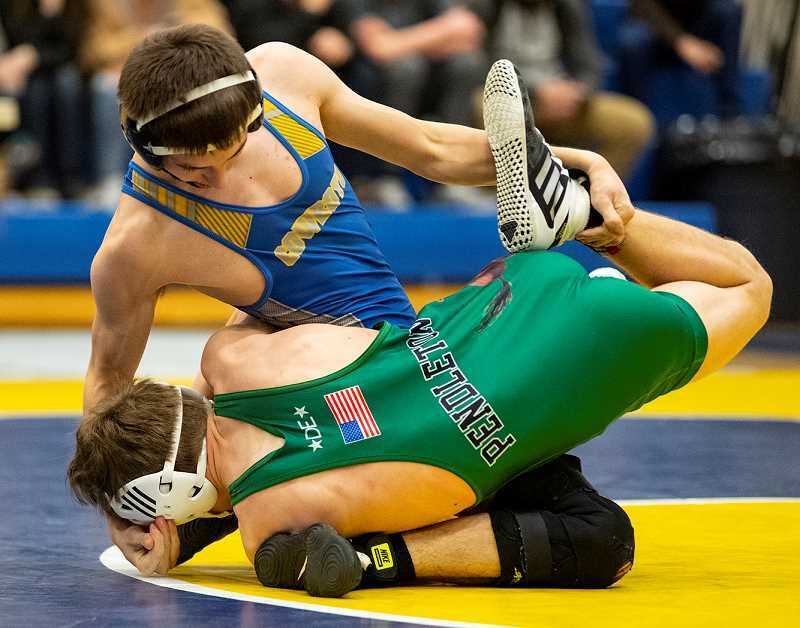 For the past several years, the Crook County Cowboys have hosted dual meets on the eve of the Oregon Wrestling Classic. The annual event, which features teams each competing in two duals, was historically named the Clash Before the Classic. Prior to the start of this year's event, a large sign was brought out and placed on the wall, and the name of the event was changed to the Mike Shinkle Memorial Duals in honor of late CCHS head wrestling coach Mike Shinkle, who recently passed away. After the announcement of the name change and a moment of silence to honor Shinkle, wrestling began and, as expected, the Cowboys dominated their opponents. Despite recent injuries, the Cowboys had no trouble quickly dispatching league rival Pendleton in their opening dual, blasting the Buckaroos 69-9. Then, in their second match, the Cowboys rolled past Molalla 72-6. Those injuries, leg injuries to 220-pounder Mario Hansen and 120-pounder Trevor Martin, forced Crook County to juggle its lineup for the duals but didn't appreciably impact the outcome of either dual. In other matches on the night, Mazama rolled past Molalla 51-27, then defeated Estacada 54-30. The Cowboys opened quickly against the Buckaroos, picking up five consecutive pins. Heavyweight Caleb Parrott started the night off with a pin of Pendleton's Travis McGee just 33 seconds into the first round. At 106 pounds, Tucker Bonner pinned Collin Primus 1:20 into the match, and the Cowboys quickly had a 12-0 lead. Tannon Joyner kept things rolling with a second-round fall over Kellen Hanson of Pendleton at 113 pounds. That win was followed by pins from Steven Ware over Caleb Tremper at 120 pounds, and Hunter Mode over Gabe Browning at 126 pounds, giving the Cowboys a 30-0 lead. Zach Mauras kept things rolling with a 7-2 decision over Alex Rendon as the Cowboys opened up a 33-0 lead over the Buckaroos. Pendleton finally got on the scoreboard when Chris Chambers took an 8-2 decision over Gage Perry at 138 pounds. Brayden Duke, 145, and Ben Sather, 152, then picked up back-to-back pins for the Cowboys, defeating Blake Davis and Kyle Liscom, respectively. Pendleton picked up their final victory of the night at 160 pounds as Isaac Urbina pinned Gavin McLean midway through the third round. The Cowboys then closed out the nights with falls by Garrett Bond, 170, Kyle Knudtson, 182, Jaxson Rhoden, 195, and Hayden Hilderbrand, 220. The score was even more lopsided in the nightcap as the Cowboys cruised past the Indians. However, that match featured an upset of sorts as Molalla's Maximus Tate, ranked No. 2 in Class 4A, defeated Mode, ranked No. 1 in Class 5A, 6-4 in their 126-pound match. Tate took an early lead, and although Mode came back late in the match, he was unable to overcome the deficit. Molalla won just two more matches on the night as Celab Taylor pinned Bond midway through the first round, and Emmett Smyth outpointed McLean 10-5 in their 160-pound match. The remaining 11 matches included 10 Crook County pins and a Molalla forfeit. Parrott won his heavyweight match by forfeit before Bonner came from behind to pin Molalla's Dustin Asher at 106 pounds. Joyner earned a quick first-round fall over Wyatt Steach at 113 pounds, while Ware pinned Alec Lowry also in the first round. Mauras, 132, Perry, 138, Duke, 145, Sather, 152, Knudtson, 182, and Rhoden, 195, also picked up first-round falls. Hilderbrand then closed out the night with a second-round fall at 220 pounds. The match with Pendleton was especially important as it will go a long ways toward determining seeding for the Intermountain Conference Championships, which will be held Friday and Saturday, Feb. 8-9 in Pendleton.